EASY & FAST TO USE & WISPER QUIET! JUST SELECT A CHANNEL & IT AUTOMATICALLY MOVES TO THE CHANNEL! 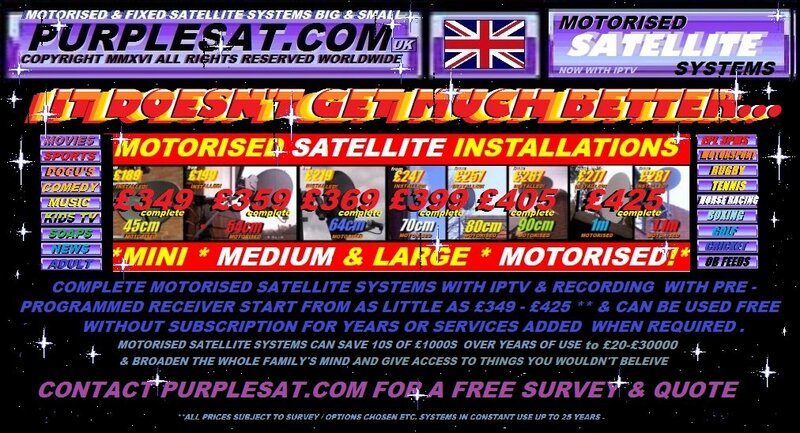 UP TO 10,000 CHANNELS & UP TO 50-60 SATELLITES & 1000s of IPTV CHANNELS! PREPROGRAMMED WITH C. 50-60 SATELLITES- UPTO 10,000 CHANNELS & 650 iptv CHANNELS! 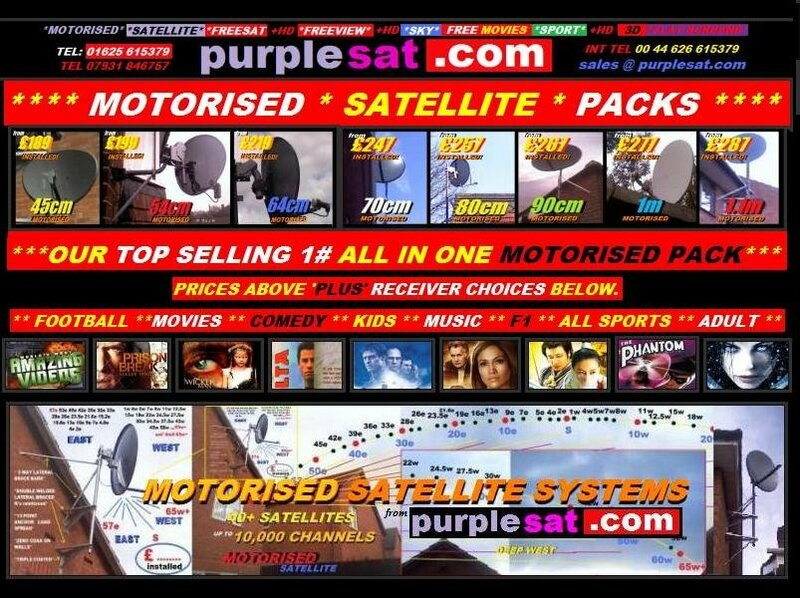 ACCESS TO UK FREE & WORLDWIDE CHANNELS ..
FREE PREMIUM MOVIE CHANNELS* FREE SPORT* MUSIC* DOCU'S*ADULT *CHANNELS !. ACCESS TO CHANNELS ALL AROUND THE WORLD! WEATHER - NAS & PC HDD ACCESS PLUS OTHER FEATURES ADDED etc.. PAUSE * RECORD* REWIND * EDIT * CHAPTERS* CUT * COPY * VIDEO etc. RECORD 2 CHANNELS ** WHILE WATCHING ANOTHER CHANNEL OR REPLAYING OR STREAMING. WITH IT'S OWN MODULATOR TO SEND THE PICTURE AROUND YOUR HOUSE. EASY cccam & NewCam + BISS-CW & CAS KEY LOADING! OR easy Patch & upload ALL from USB stick. Based on very efficient motorised sky mini dishes with 4 outputs [1 wired]. LOOKS LIKE A SKY DISH! Can receive channels from c. 70e e 68.5e 66e 62e 57e 55e 53e 52e 47.5e 46e 45e 42e 39e 36e 33e 31.5e 30.8e 28.2/5e [26e*] 23.5e 21.6e 19.2e 16e 13e 10e 9e 7e 5/4.8e 0.8/1w [4w*] 5w 8w 12.5w 15w 18w 20w 22w 24.5w 27.5w 30w 34.5w 37.5w 45w 55w 62w 70w [*depending on location/ broadcasts & line of sight]. Based on a very efficient motorised sky zone 2 mini dish with 4 outputs / 1 wired. Looks like a sky dish. Better reception on all the above satellites & beams on those satellites & improved severe weather margins. Based on a motorised Triax TD78 (70cm x 78cm). Improved reception on the above plus can receive channels from the weaker satellites 26e/7.3w if in the right location. Based on a motorised Triax TD88 (85cm x 95cm). All the above plus improved reception from 26e / 7.3w & the free movie channels. Based on a motorised Orbital 1m (95cm x 105cm). Improved reception on 7.3w/26e & possible 4w/7w reception. Based on a motorised Triax TD1.1 (110cm x 100cm). More & better reception on 26e/7.3w & possibly 4w/7w reception. Better reception on the weaker satellites - based on diseqc motor mounted 1.2 steel or alloy press dish. Better reception on the weaker satellites - based on 36v motor & controller & Channel Mastyer 1.2m dish. Better reception on the weaker satellites - based on 36v motor & controller & Hirschmann 1.5m dish. Better reception on the weaker satellites - based on 36v motor & controller & Channel Master 1.8m dish. Better reception on the weaker satellites - based on 36v motor & controller & Channel Master 2.4m dish. [**Subject to survey & availability.